1980's Vintage knitting pattern. 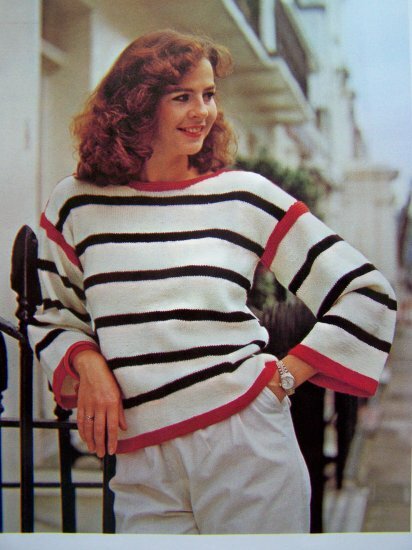 Misses Knitted sailor top sweater pattern.Original pattern not a copy. Includes only the pattern not the completed item. Book 1,2. Perfect for holiday wear - this striped pullover in stockinette and garter stitch looks good with jeans, shorts or over a swimsuit when the sun goes down. Knitted in lightweight double crepe yarn. Since the top is designed t fit loosely you might want to make a size smaller if you prefer a snugger fit. Measurements: Bust: 32 - 34 - 36 - 38". Length from shoulder: 25" for all sizes. Sleeve seam: 18" for all sizes. Yarn: Lightweight double crepe yarn. Needles: 1 pair each of No 5 and No 4 knitting needles. 2 stitch holders. S & H to the USA is 1 penny folded and mailed in a long envelope.